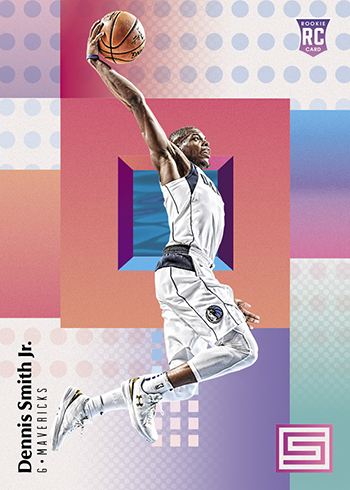 The 2017-18 Panini Status basketball checklist has been released along with some pictures of the cards and my first impression is that the cards look like phone cards from 1994. Now let me address the die-cut parallels. 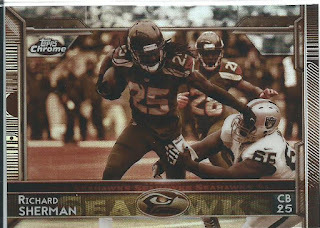 Die-cuts are supposed to accent the card and/or shapes in the design, not just random cuts of varying widths and depths. 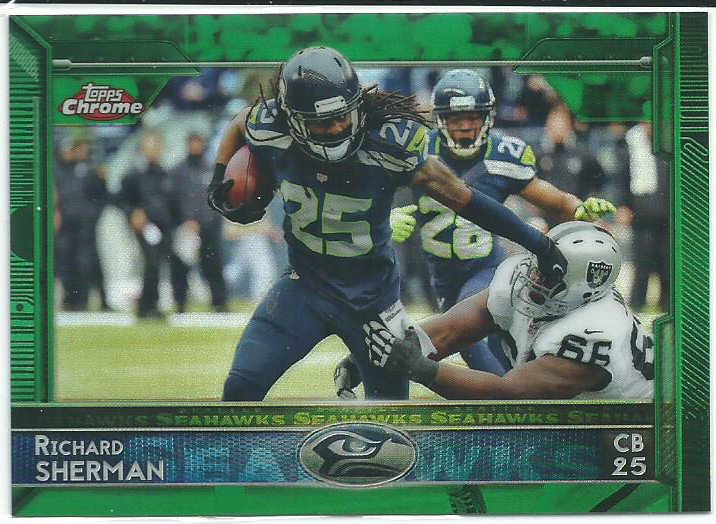 This adds nothing to the card but in my eyes it detracts. Monday Question Day- Cool Relics? 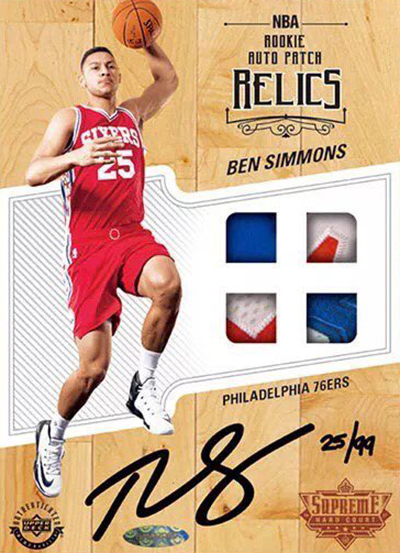 What unusual relic would you like to see in a card? 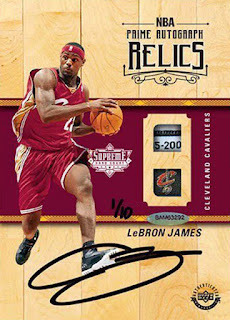 There are already some unusual relics in cards but they are not as common as the usual “Event Worn” memorabilia that shows up. In sports I would like to see shoes show up more often. Maybe do a cleat card with a single cleat from a football player’s shoe. In non-sports, there are so many options. 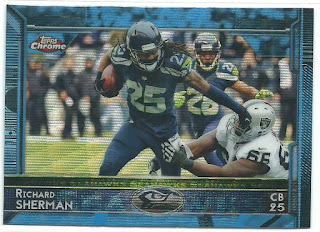 Cryptozoic’s Totally Fabricated relics, while they are manufactured relics, are very cool and bring us closer to comic books and animated shows like Archer so why not continue the idea in to other companies and their licenses? Who wouldn’t want a Totally Fabricated piece of the Death Star or some rocks from Alderaan? That is the odd thing about the Star Wars license, there are very few relics of any type; Ewok fur, Chewbacca fur, Jabba’s sail barge sail, bunker pieces from ROTJ and now Stormtrooper pieces. Where are the pieces of Han’s blaster? Luke’s lightsaber? Leai’s slave outfit? Upper Deck has an official NBA licensed product releasing this year but in a very unique style. The set isn’t cards per se, but more memorabilia with a trading card style and it will be sold in pack/box form. 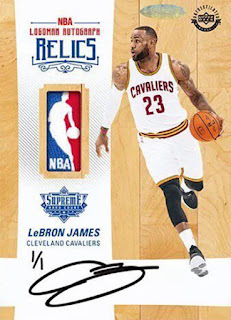 The checklist will include retired players, stars and rookies including the three NBA players that Upper Deck has signed to exclusive deals; Michael Jordan, LeBron James and Ben Simmons. 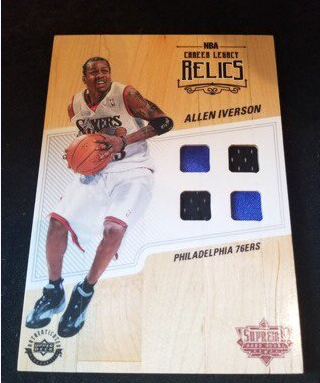 Some other stars on the checklist; Allen Iverson, Jerry West, Steph Curry, Andrew Wiggins and Dennis Rodman. 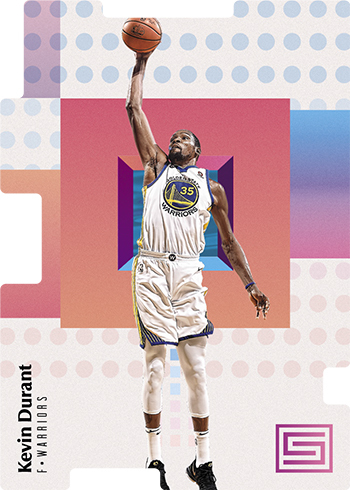 The NBA has given UD the “Ok” to produce the set because it is being sold as memorabilia so the “cards” depict each of the stars in their NBA uniforms with full logos and names. The 2017-18 Upper Deck Authenticated Supreme Hard-Court Basketball release is different because each card is a 5x7 piece of game-used wood from a Charlotte Bobcats floor and is basically designed to look like a card. 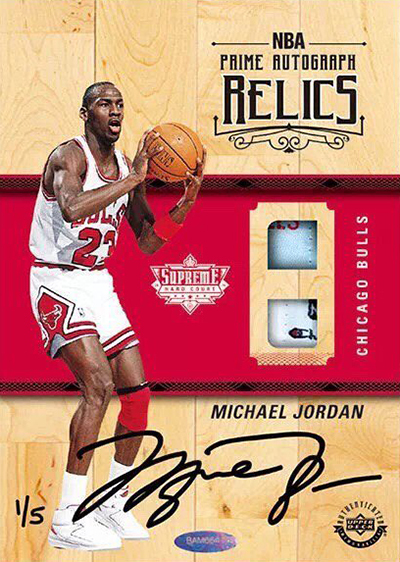 Each box will contain two packs and each pack will contain one card, no release date or price has been announced yet but I have found information saying there are 17 signers on the checklist and the price may be around $500/box. I wonder if this works out for UD, if they will continue to work with the NBA for similar memorabilia sets. 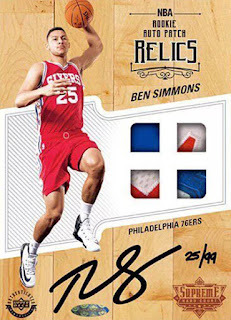 These small and very limited products gives Upper Deck an NBA presence without encroaching on Panini's license and gives the NBA control over what Upper Deck produces. Kind of a win-win for both. 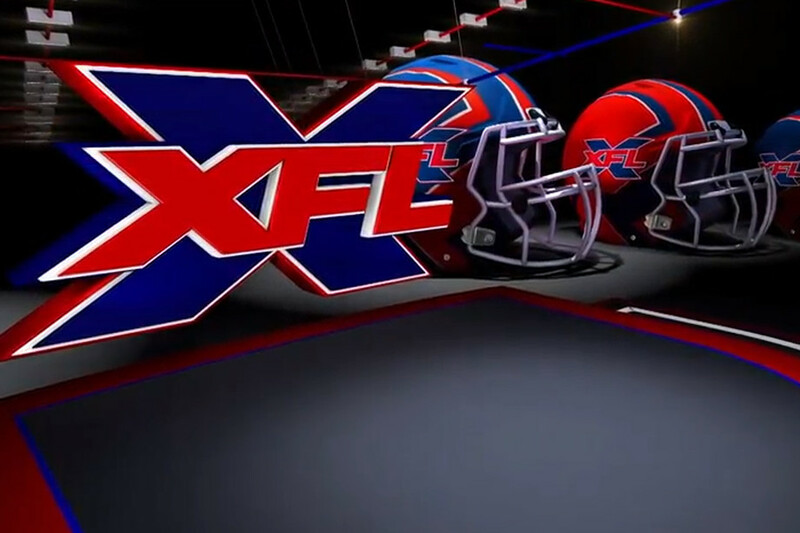 It is official, there will be an XFL reboot and play starts in 2020. Some of the information released during Vince McMahon's announcement today is that there will be 8 teams of 40 players each and that the teams will be owned by the league. 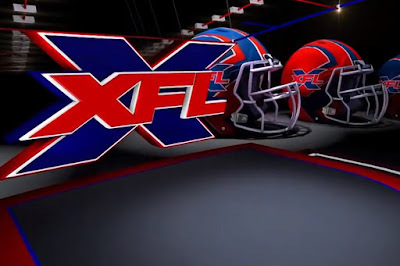 McMahon also said that the league is about football, not about wrestling, politics or social issues. A couple of other points he made; the game will be family friendly, safer and faster (he wants games to last no more than 2 hours). 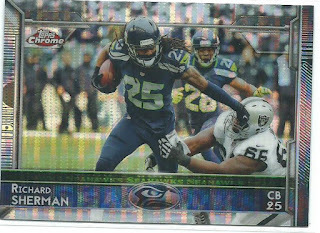 I was going through my recent Steve Largent additions and adding the missing cards to my TCDB collection and I noticed after I scanned in three parallels from the 2005 Donruss Elite Back to the Future insert that the serial numbers are not printed the same way. The green parallel that is #/1000 has the top of the serial numbers nearest to the right border while the Blue #/500 and Red #/250 have the bottom of the serial numbers facing the right border. I took a look at other player’s cards in the insert set and they are all serial numbered like mine, with the green parallels having their serial numbers in a different direction than the blue and red parallels. I think the only reason I noticed this is because of my OCD and need for order. Damn you Donruss for messing with me and flipping the card sheets when printing the serial numbers. 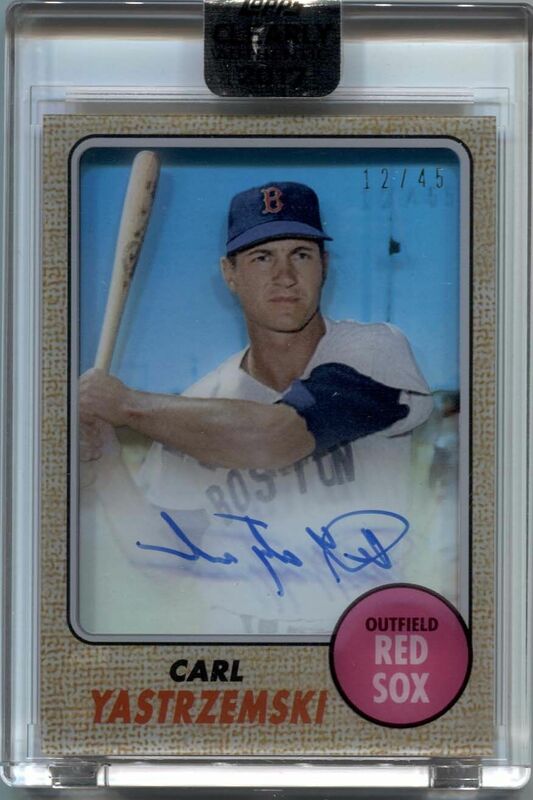 I came across this one on Twitter and it turns out that Yaz signed the backs of all of his base 2017 Topps Clearly Authentic autograph cards so his signature appears backwards, the parallels were signed on the front. 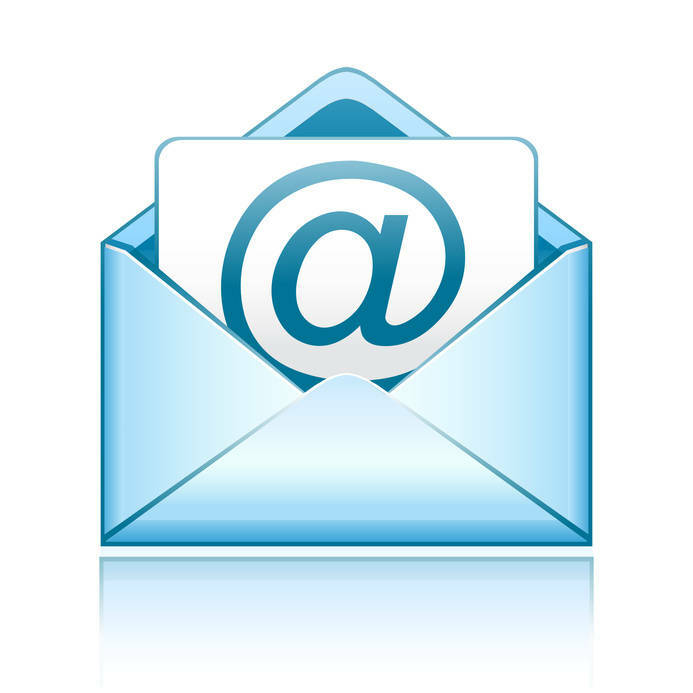 As a buyer would this affect you? 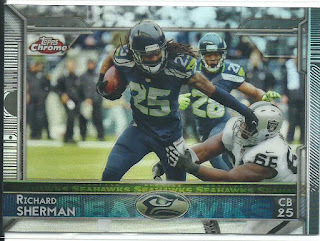 Does it lower the value of the card or would you skip it all together and maybe chase one of the parallels that were signed on the front? 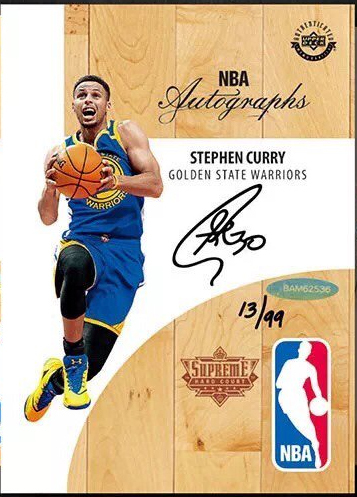 There are currently 3 base autographs up for auction running with BIN prices of $115-150 and in the past three months there have been 5 sales running $67.91 through $108.88 so they are selling but you wonder if more would have sold had they been signed correctly. Would you rather be Tommy John and have a potential career ending injury named after you or Mario Mendoza and have a potential career ending batting average named after you? I would rather be Tommy John, medicine has made advances over the last few years so Tommy John surgery isn't a career ender like it once was but a .200 batting average lasts with you forever. 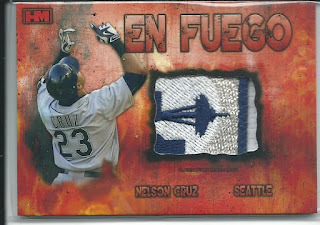 A one card post today from the 2017 Hits Memorabilia release. 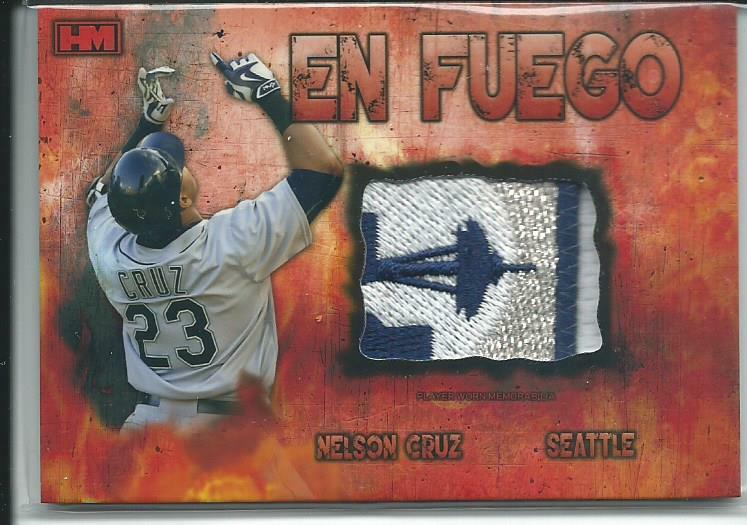 This En Fuego Nelson Cruz patch card is #3/3 and I found it for under $5 delivered. 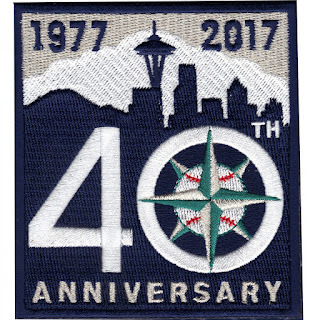 At first, I was confused about the logo because the Mariners have been using the nautical compass as the logo since 1993 but then I remembered that this past season they wore a 40th Anniversary patch on their sleeve. A List Of All The Scents Acceptable With Cards... Gum, That Is All! I purchased a card last week from a high rated comic book seller on eBay for a great deal. 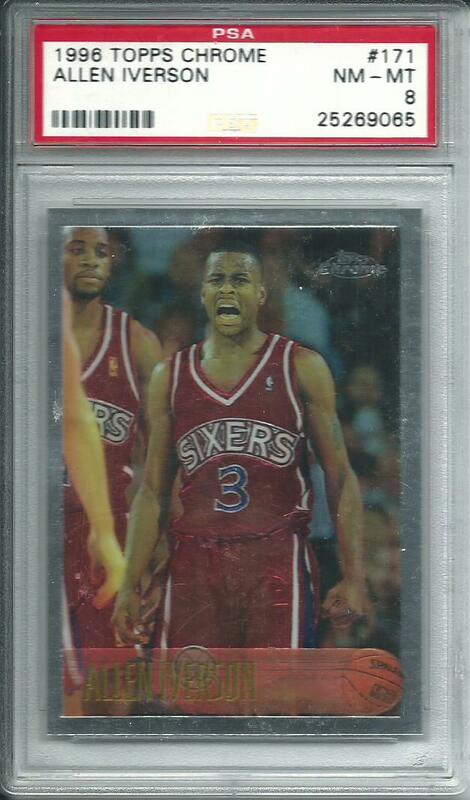 It isn’t a major card but a nice cornerstone for one of my mini-PC collections. 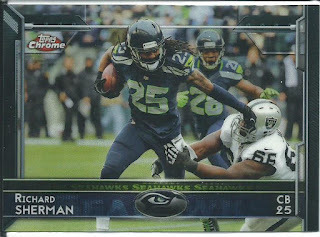 It shipped quickly and was secured nicely so I have no complaints about that but when I got the card and opened the cardboard they had around the top loader I got hit with a smell almost as bad as cigarette smell. It smelled like the seller had just sprayed a flowery air freshener right in to the padded mailer. 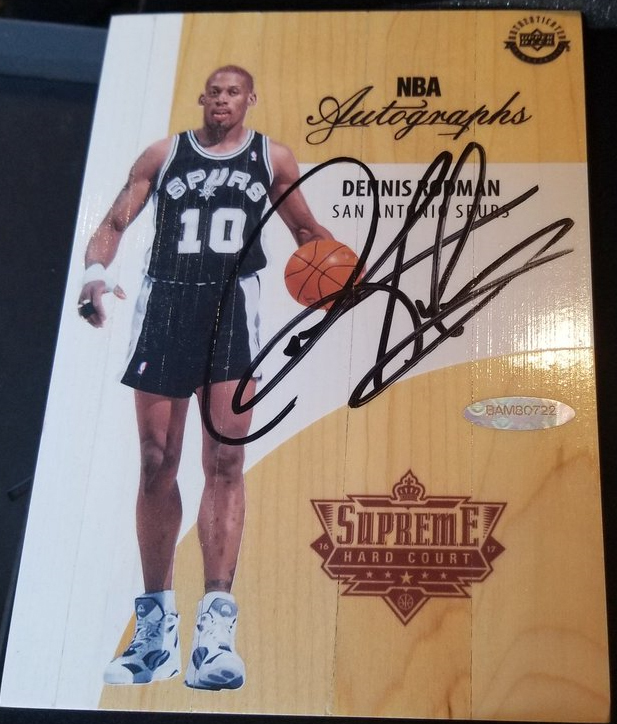 I tossed all the packaging, including the top loader and penny sleeve, and I have the card sitting next to my monitor in hopes that the smell will eventually dissipate. 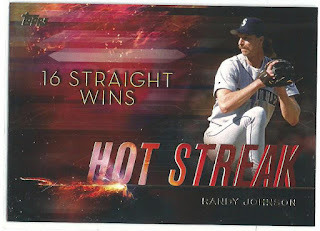 I’ll admit, I would rather have a rose smell compared to tobacco but any aroma other than gum doesn’t belong on a card. One of the most accomplished wrestlers ever was Andre the Giant and over his nearly 30-year career he also became one of the most famous wrestlers too. You can even say it was Andre who made Hulk Hogan who he is because of their WrestleMania III match when Hogan defeated him with the “Body slam heard around the world”. Andre began wrestling at the age of 17 in 1963 but it wasn’t until the early 1970s that he began to make a name for himself while he was in Japan. 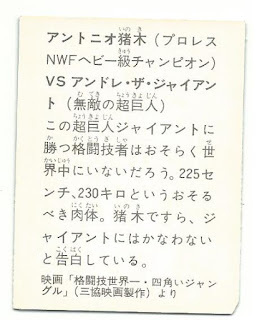 His first card, his rookie card of sorts, was included in the 1973 Wrestling Annual #6 magazine. 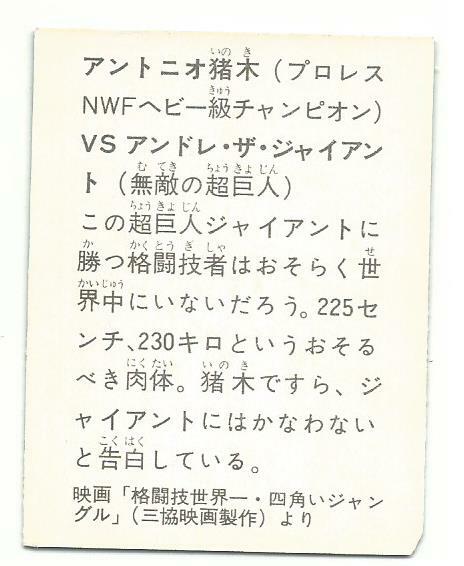 In 1974 he had cards in the Yamakatsu set and in 1978 he appeared in the Amada Kings set. The 1978 Amada Kings release was made up of regular sized cards as well as minis and I believe Andre appeared on at least four cards. 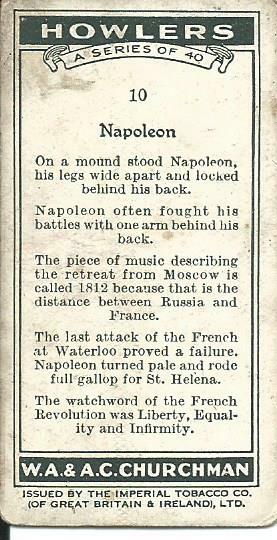 This is one of those cards, and it is the mini version. 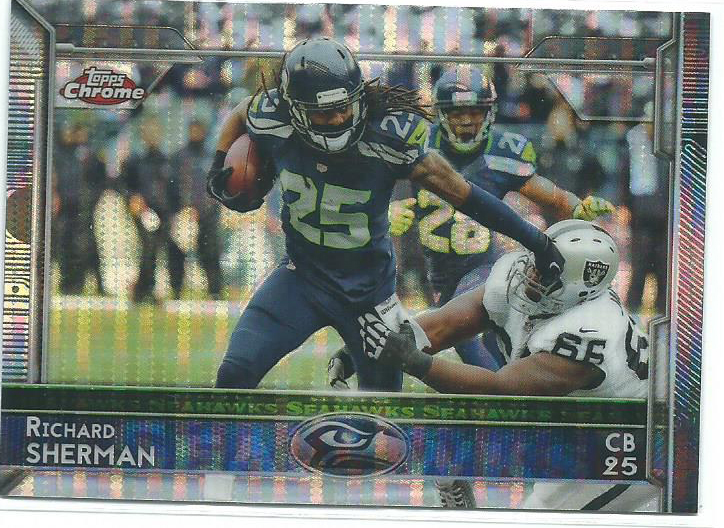 The card was $7 and was part of my COMC order, the reason it was relatively cheap is because the bottom left corner is clipped. 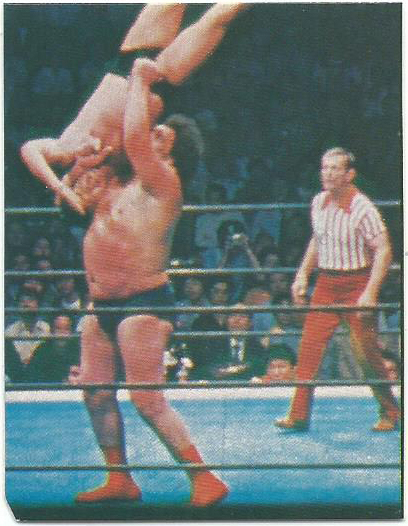 You may not have noticed but the guy about to be suplexed by Andre is fellow WWE Hall of Famer Antonio Inoki. 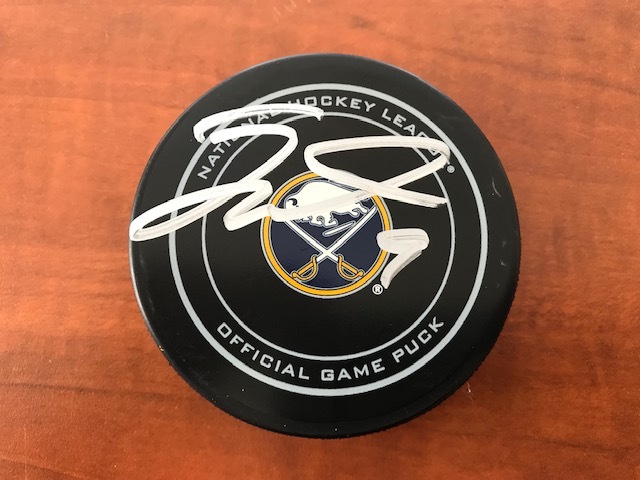 When a favorite athlete retires there is usually a bump in their prices but what about when someone gets hurt and can no longer perform and forced in to early retirement? 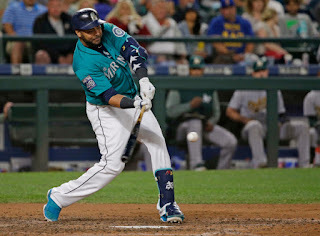 There was a time when Tommy John surgery or microfracture surgery were career enders, but in just a couple of years medical field has advanced to help save those athlete’s careers but there are still some injuries you can’t come back from no matter what. Two weeks ago at a WWE house show Paige, real name Saraya-Jade Bevis, took a kick to the back by Sasha Banks which dropped her to the canvas and the match was halted. Initially it was assumed to just be a stinger, a pinched nerve and can cause various side effects like numbness or pain down the back or arms, but because she had neck surgery in October 2016 that required screws to be inserted in to her neck the WWE determined that it is safest to end her career after additional medical review. Now in a case like Paige’s where her wrestling career is over, is she still collectible? Do you think there will be a rush on her limited autographs? This morning while listening the radio there was a break and the DJ announced that Dolores O’Riordan, lead singer of the Cranberries, died suddenly and unexpectedly this morning in London. She was 46 years old and no cause has been announced. I am absolutely stunned, and this really brought me down. The 1990s were very turbulent for me and one of the few stabilities that I had was music and the Cranberries were part of that stability for me. 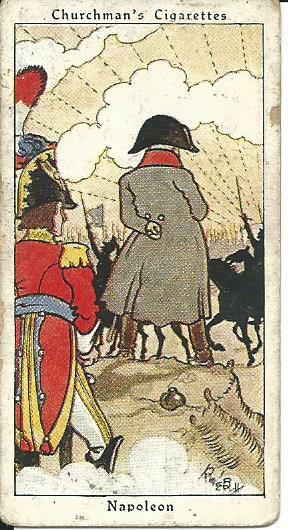 This month’s VCoM comes from Howlers Tobacco and were issued in packs of Churchman Cigarettes in 1937, it is the standard tobacco era card size and depicts the Little General watching a battle in the background. 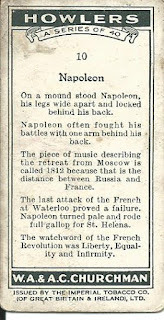 The Napoleon card is #10 and there are 40 cards on the checklist that would make sets like Goodwin Champions and Allen & Ginter’s proud. The set is made up of an odd collection of leaders (Napoleon, William the Conqueror, Julius Cesar, etc. ), hobbies (gardening, music, etc. 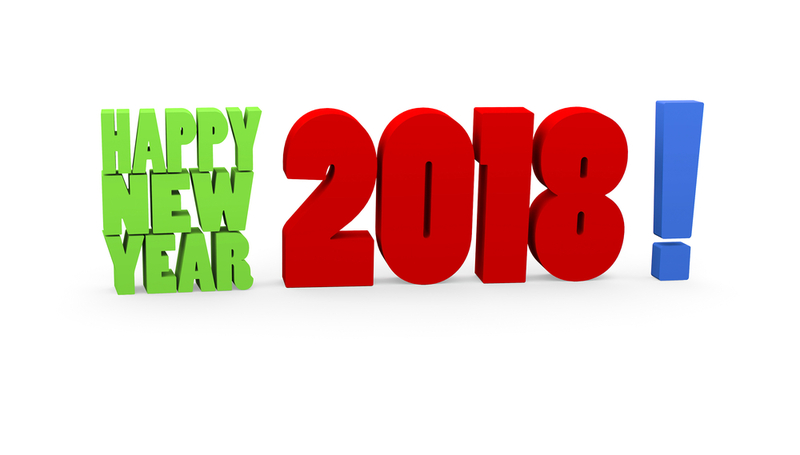 ), careers (politician, doctor, etc.) and oddities like gravity, fish, stocks & bonds. I have decided to cut back on non-sports vintage cards unless it is a subject that interests me, like the Red Baron, but a vintage Napoleon card with a great colorful illustration for a low price was difficult to pass up. 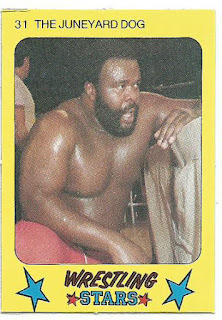 In the early 1980s, when I first really started to watch wrestling, the Junkyard Dog was one of my favorite wrestlers. At the time there were virtually no wrestling cards besides the 1985 Topps WWF set so picking up any JYD cards during his wrestling days is very limited. I do have a number of his 1985 Topps cards and his 1987 Hostess but this was the first time I came across his 1986 Monty Gum Super Wrestling Stars card. 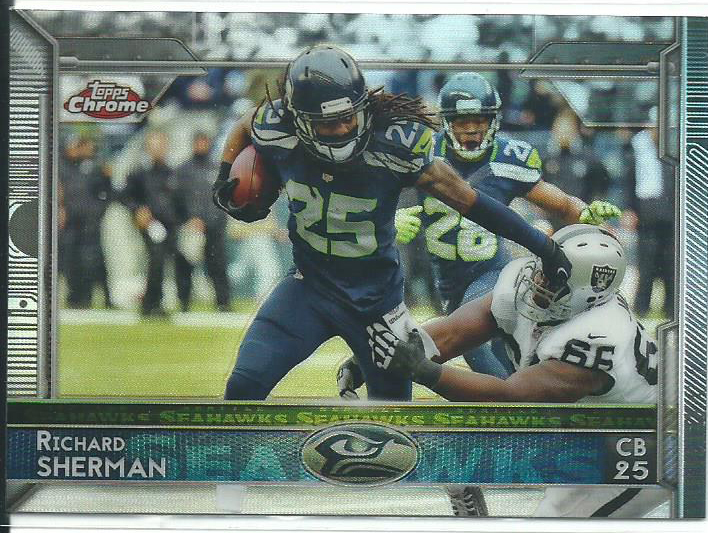 I guess not including “Juneyard” in my search kept this beauty from showing up. After I came across the JYD Monty Gum card by accident I looked to see who else was on the checklist and I found this amazing Hulk Hogan & Muhammed Ali card. 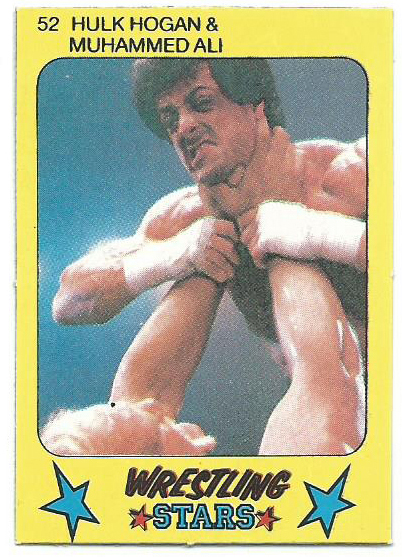 I remember Thunder Lips fighting the ultimate meatball in Rocky III, not Ali. Maybe I am remembering the movie wrong. 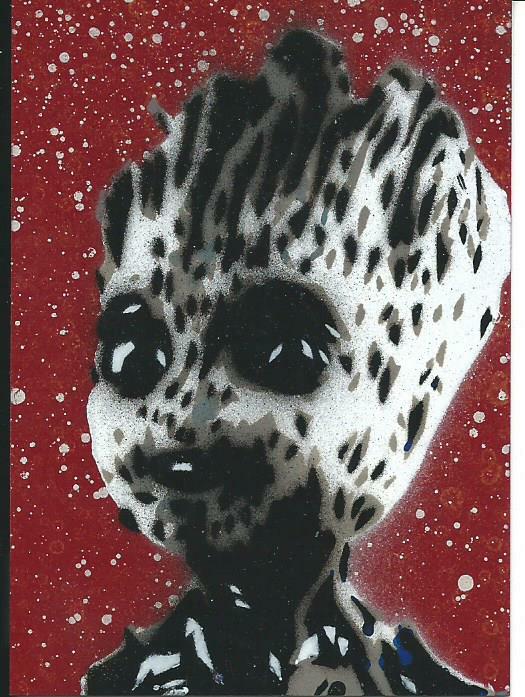 This month’s Art Gallery Display comes from the artist Jason Adams who has a very unique style, he uses stencils and spray paint for his sketch cards, and I really dig his style. This card is very important to me because it is a commission I had done for my daughter for Christmas. We have a couple of movies that are “our movies” that we will watch together whenever they are on and Guardians of the Galaxy is one of those films. Her favorite character being baby Groot, for the record mine is Rocket Racoon, so when the opportunity was available to have one of my favorite artists do a card for my daughter of one of her favorite characters I took it. When you are working on a PC rainbow and you are down to the final two cards and you can not find them, what do you do? 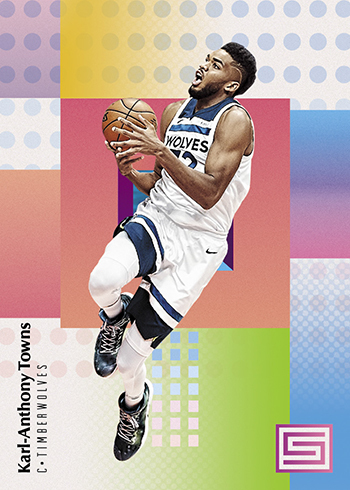 If you said start another rainbow of another player we are thinking the same thing and it is driving me crazy that I even considered it. 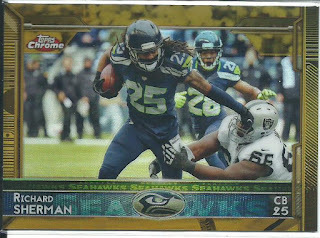 In 2016 I decided to chase the 14 parallels of Marshawn Lynch’s 2013 Topps Chrome #6 card and to keep from going totally mad I decided to not chase down the #1/1 Superfractor or the four printing plates. 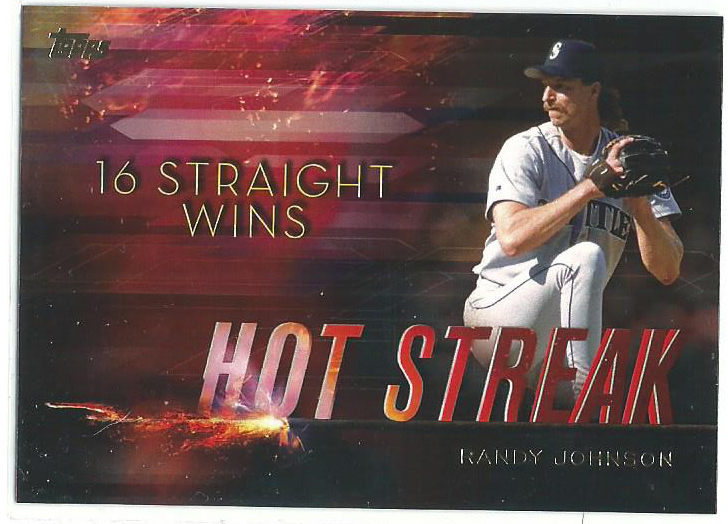 I hit 11 cards and was halted and last June I considered selling off the cards I have and wash my hands to that rainbow, but I ended up finding the Blue #/199 that I needed and it kind of renewed my search. 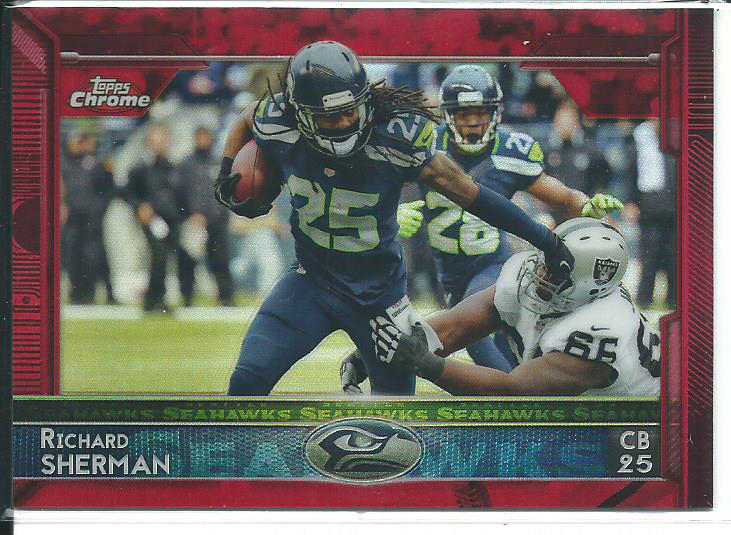 I am currently sitting at 12 of the 14 cards, missing the Gold #/50 and Red #/25, and I am at a standstill again. 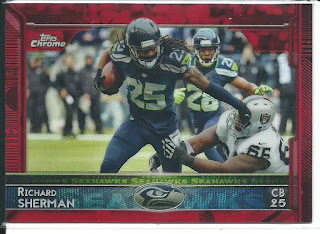 I began the chase shortly after I picked up the last Lynch card in June and I was able to find the base card and 13 of the parallels for way less than I have invested in the Marhawn Lynch rainbow. I decided to stick with ignoring the Superfractor and printing plates so there is the base, 14 parallels and a photo variation, so 16 cards overall. 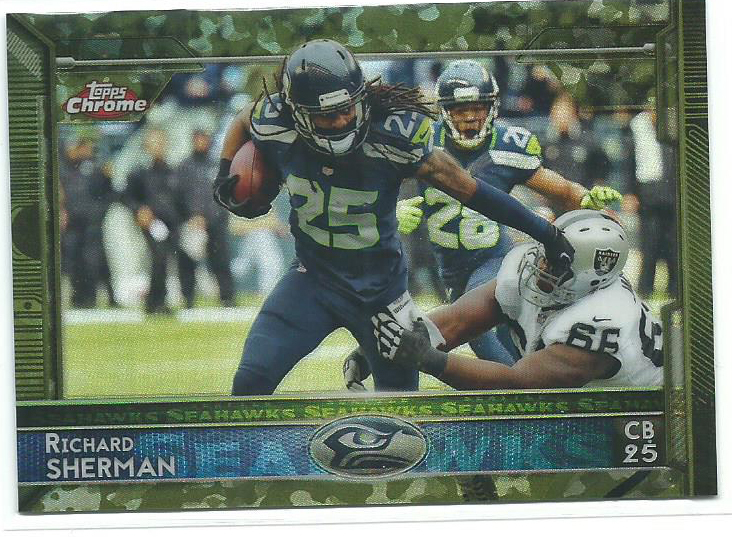 I am feeling pretty good with this chase because I was able to knock off so many of the cards pretty quick. 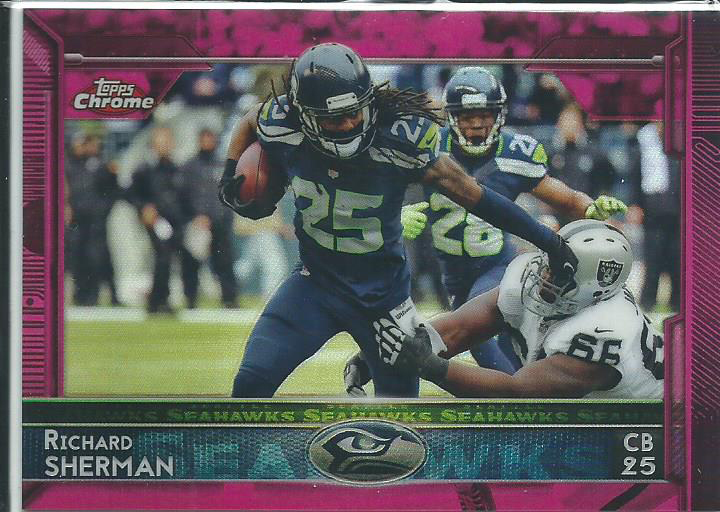 I am missing the Purple and photo variation #9.2 w/ turkey and what has given me a laugh is that the Purple is un-numbered, but I can’t find it anywhere, I can only find the purple mini version and I am collecting the regular cards not the minis. 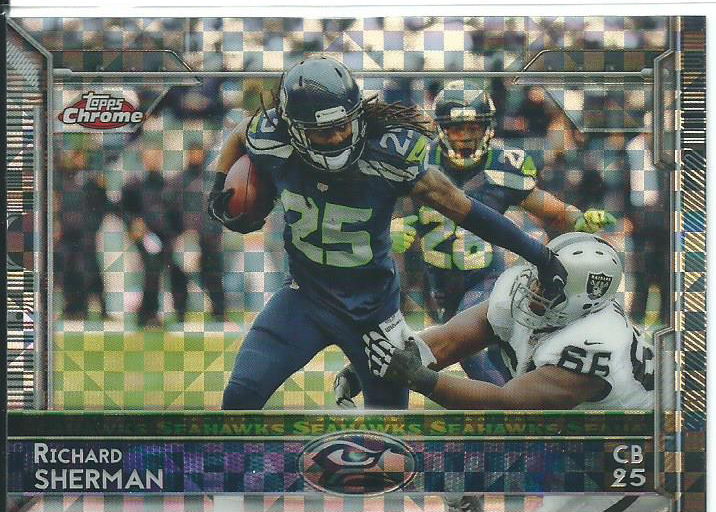 The photo variation is readily available, I just haven't picked it up yet. 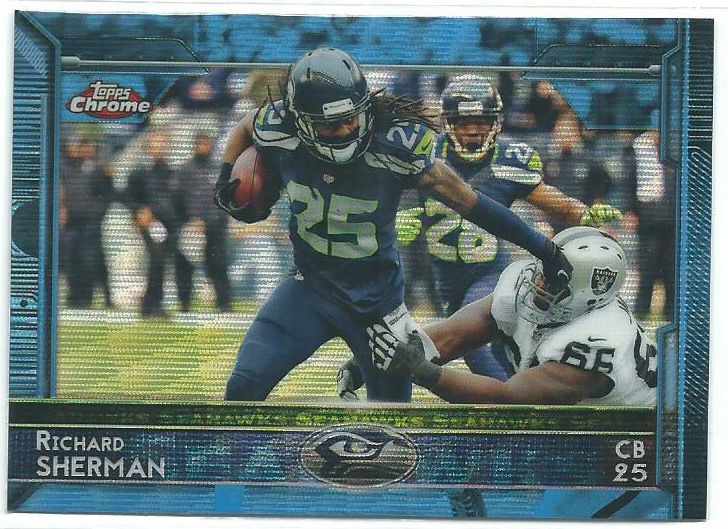 Who would have thought that the final card that I will need to complete a rainbow would be an un-numbered Purple parallel? It can be from any company at any point in time or any set no matter when it was released. I have always been partial to Upper Deck products. It is difficult to pick a specific set but I like the early Stadium Club releases too. Could you imagine Ichiro as the leadoff hitter in the Mariners batting order since 1992? 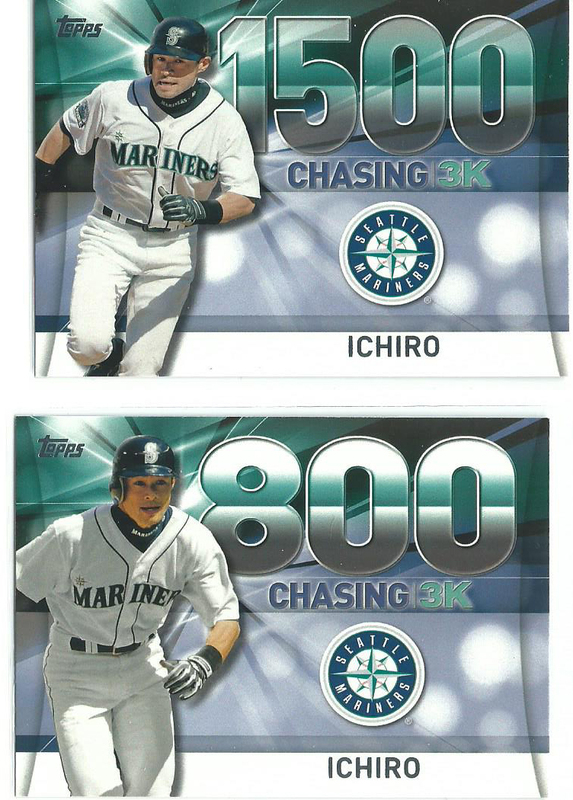 Ichiro at #1 and then Griffey, Buhner and Edgar at #3, #4 and #5. 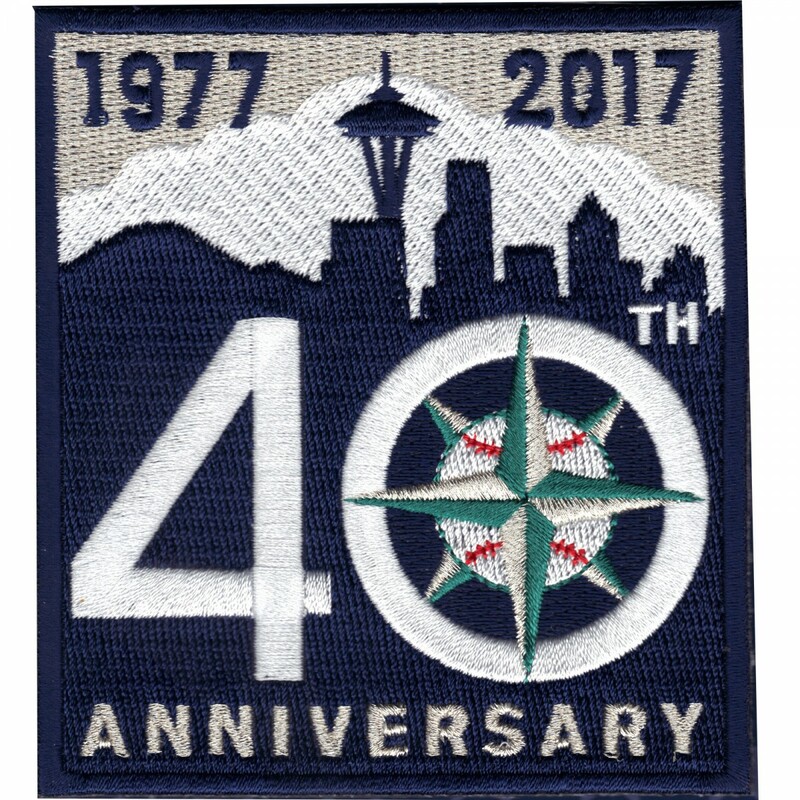 The Mariners would have won the 1995 World Series not to mention Ichiro would be the current MLB all-time hits leader. 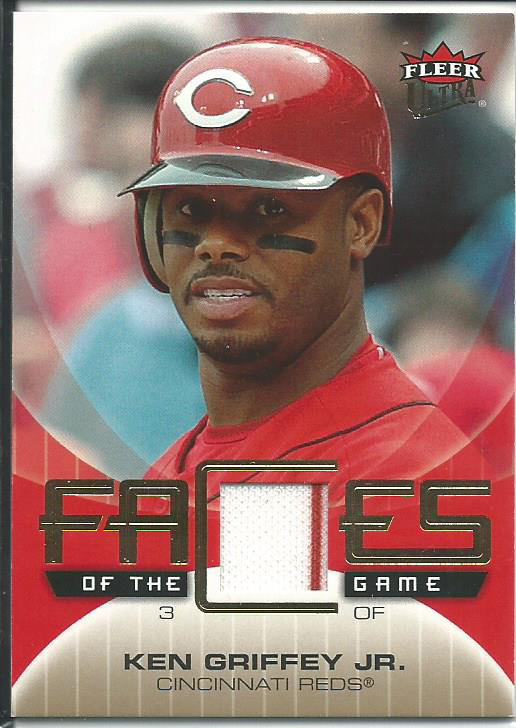 2013 Topps Museum Collection Green parallel Ken Griffey Jr.
2007 Ultra Faces of the Game relic Ken Griffey Jr. Thank you, Chris, you nailed it with your selection of cards that you sent. I kind of splurged a bit around my birthday last year and completed the autograph checklist from the 2013 Topps Mars Attacks! release. 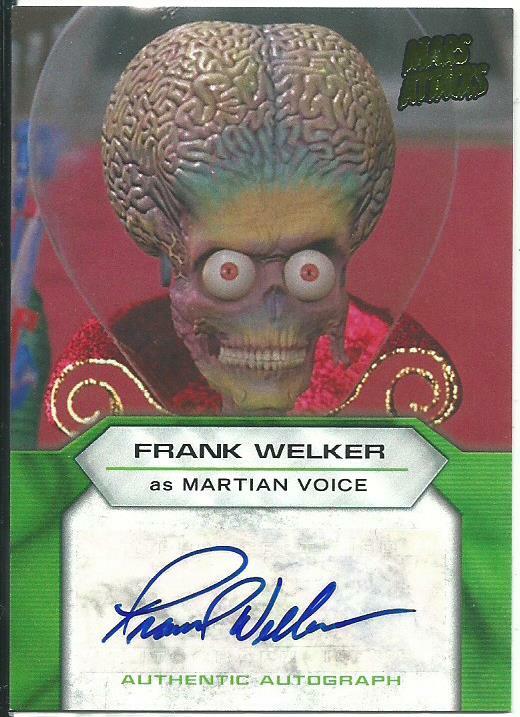 I was missing just the Frank Welker autograph, he did the voice for all of the Martians in the movie, really he just said “Ack Ack”. 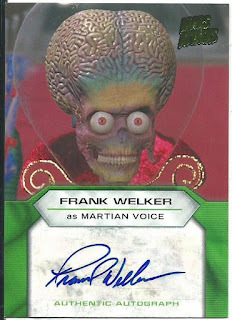 The Welker signature has been united with the other movie autographs of Willie Garson, Brian Haley, O-Lan Jones and Pam Grier in a 9-card pocket page plus my two woodcut cards from the Mars Attacks! Occupation release. Like many people who purchase cards through COMC, I purchase some cards throughout the year and then wait until the Black Friday sale with free shipping to request their order. 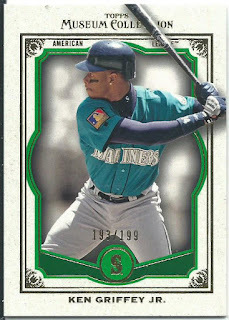 I ended up having 79 cards in my most recent order with most being Griffey and Buhner and the rest being a mixture of other PC/mini-PC collections, Star Wars and some oddballs. Most of the cards where under $2 but I did splurge on a card that I have wanted for almost 2 decades, a card that I missed out on this past October when I didn’t purchase any cards for my So You Don’t Have To piece. 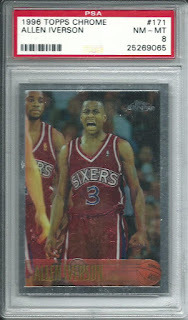 I finally added a 1996-97 Topps Chrome Allen Iverson #171 rookie card. It was on sale over the Black Friday weekend for $18 and I didn’t want to miss out again so I picked it up. If you are ready to have a good laugh, LaVar Ball announced that he is starting his own basketball league for kids coming out of high school who don’t want to go to college. This is not a joke, this is serious. 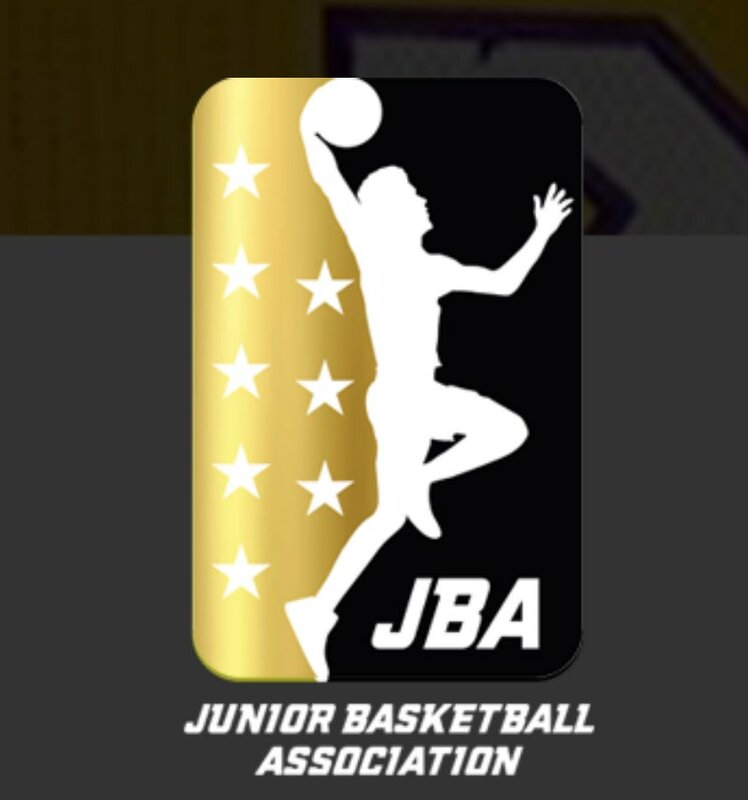 The league will be called Junior Basketball Association and will be supported by Big Baller Brand. According to Lonzo, his father has been seriously working on the idea of the league for months. Because we all know that a few weeks prep time is all that is needed to set up, organize and run a professional sports league. Needless to say, he plans on 10 teams and wants to play the games in the NBA arenas in LA, Dallas, Brooklyn and Atlanta. Does anyone actually believe that the NBA and/or NBA team owners will allow a competing league to rent out their arenas? I am honestly asking because this league is basically competing with the NBA's G-League. He anticipates 80 players and they will be paid $3,000-10,000 a month, which should be another concern for LaVar because he could be looking at paying out $400,000-500,000 in salary to the players alone each month. I held on to this story for a couple of weeks because I promised not to do any more Ball family stories through the end of the year so by now he probably has the uniforms designed, the high school gyms rented, and the league rules written out on a napkin. 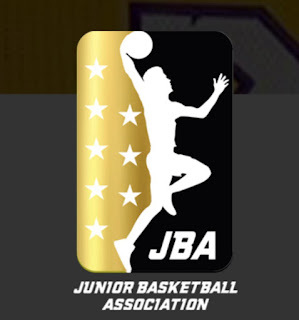 He already has the league logo designed and to nobody’s surprise it is Lonzo’s silhouette. A couple of years ago I started setting goals for both my collection and the blog, they were straight forward and obtainable, but I realized that the goals I was setting were not something that I needed to set because those were already my plans. 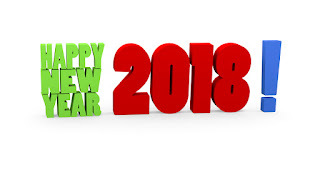 A resolution should be something new, a big change, not a continuation of my routine. That was when I stopped setting the goals but that isn’t saying I will never state a resolution for my collection or blog. 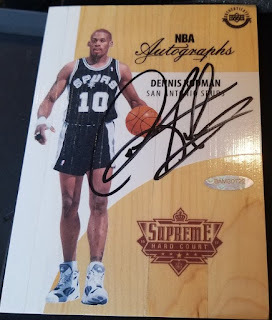 I have also decided to once again do a bit of trimming of my PC collection, not getting rid of any cards but instead focusing more on one part. 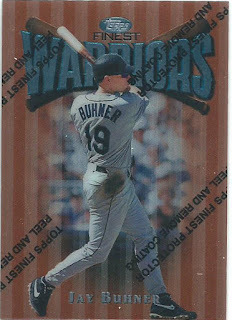 In years past I have adjusted and focused more on specific athletes and going in to 2017 I was down to just four PC players; Griffey Jr, Jay Buhner, Ryan Bader and Steve Largent. This year I am going to cut it down to two; Griffey and Buhner. 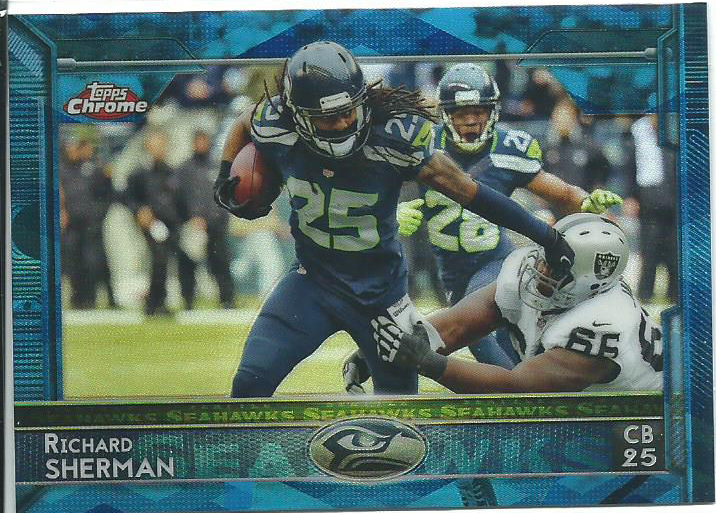 Bader and Largent will now be considered secondary-PC collections. With Bader moving to Bellator MMA he will not be included in any new Topps UFC sets so I can now take the time to hunt down his cards only when the price is right instead of rushing to find cards before the next set comes out and I add to my wants list. With Largent I was able to pick up quite a few of his low-end cards over the year and I am down to only 24 cards on my Largent wants list and about half of those are higher end/limited cards. I added just over 100 unique Griffey cards this past year, with most of those coming way of the Great Griffey Giving box and my COMC order, and I more than doubled my Buhner collection (I didn’t even realize that until today). 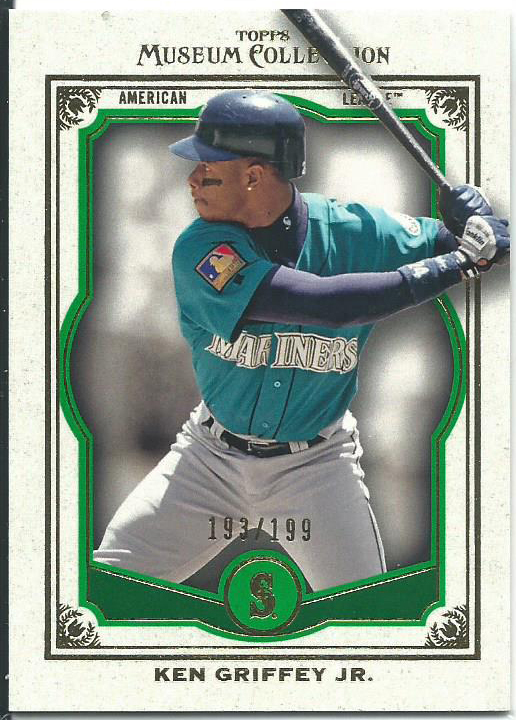 Interestingly I hit the point where I have more Griffey cards, 1,360, in my collection than I have on my Griffey wants list, 1,310.